Melbourne Numismatic Society November 2018 Meeting - Melbourne Numismatic Society Inc. The November Meeting will be held from 8-10pm on Thursday 8th at the usual venue – Box Hill Community Arts Centre, Combarton St. Box Hill. This month the syllabus topic is “A Very Large or Very Small Coin or Banknote”. For this topic bring along numismatic items that are unusually big or small. This is a small copper coin originally minted in Ephesos which is now a major archaeological site in Turkey. The coin dates from about 375BC . 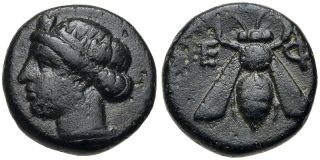 It has a female head on the obverse and the bee – a symbol of Ephesos on the reverse. It is only 10.5 mm in diameter. There will of course be time to show and talk about any new acquisitions of items that interest you. Coffee/tea and a biscuit will be served after the formal part of the meeting.